Have you ever wondered what a reggae version of Radiohead’s “Let Down” would sound like? Surprisingly, not bad! I’m loving Flickr’s new geotagging service. And apparently a lot of other people love it too. 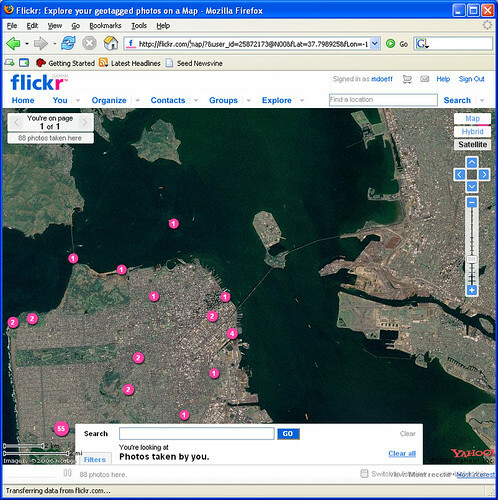 According to Flickr co-founder Stewart Butterfield, 1.2 million photos were geotagged in the first 24 hours. Click here to see my geotagged photos. Click on the pink dots to see the photos. Conan O’Brian visits the sets of popular TV shows. My personal favorite: Conan – screenname conebone69 – caught entering a house on another edition of DateLine NBC’s “To Catch a Predator”. First, click here or click on the photo shown below. This will take you to Zooomr. Then place your mouse over the photo to find the portals. They appear as rectangular outlines overlaid on the photo. It will take a few seconds for the portal to appear as an image within an image. Clicking on the portal will give you a more detailed view. Do this again on the next photo. Eventually you will get to close-up detail on several San Francisco landmarks such as Coit Tower, Palace of Fine Arts, and Alcatraz. It appears that Zooomr portals does not work with Internet Explorer. It works best with Firefox.